Life on the prairie in the late 1800’s was hard…just darn hard. You’d better be lucky or you better be packing to move back east. Folks have a tendency to remember the extremes of life, the hardships or the ecstasy of everyday. Those peaks and valleys were often shared with family in the form of letters back home or memories written in a diary for later reading. There is something about reading memories about a terrible situation survived from a distance of decades that allows us to appreciate and savor how lucky we were. Sarah Alice Salmans Abbott was the oldest of 11 children and she was a wonderful writer and archivist of family memories. I share some of those experiences from her writing. 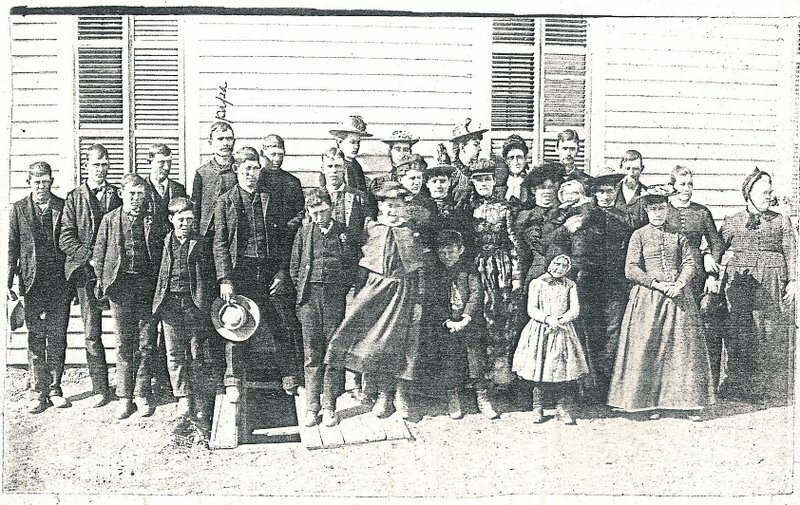 The Levi Franklin Salmans family of Larned, Kansas. “There were hardships then, real ones, although now they seem very laughable. I remember one night in the old soddy house, when the carpenters were working on our frame house, the floors of both rooms were turned into beds at night. We five girls had our bed in the kitchen. It rained and rained, and the sod roof leaked an leaked. Our bed got wet so we had to get up on the table, and there we slept that night with water standing all over the kitchen floor. Mother Rose had put pans up over the table bed to keep the rain off of us. Cold weather came before the house was finished but Pa Levi and the carpenters worked against time to get it done before the storm came. Just as soon as the roof was on and enough work done on the house, so we could live comfortably, we moved in, with carpenters still working all about us. Pa was in a hurry to get the house up so most of the trips to Larned (KS) that fall were to get only lumber. Plans were all made to go into town for coal and provisions, the day after we moved in. But that night the great blizzard came, and it was a very long time after that, that Pat got into Larned for the supplies of any kind. There was, you remember, twelve of our own family and three of the carpenters to be fed, as they were stranded there. Mother Rose was very worried, but luckily we had plenty of flour, that is, it lasted until we could get some more, Mother made it last. It was the fuel that was so scarce, that worried Pa, that was the worst hardship of all. We had burned all the waste lumber left from the house, and after the men and boys could get out of the house, they pulled sunflower and corn stalks, these were dried under the kitchen stove, for fuel. 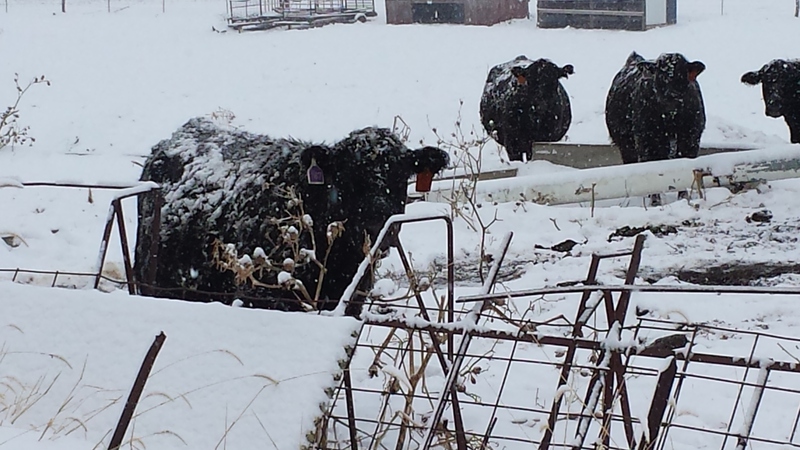 Cows in the heavy snow of February 2015. Aunt Ally was writing about a winter in Kansas in the late 1880’s or early 1890’s. She didn’t write down the date. It is interesting she chose to say that the hardships “seemed laughable now”. Difficult blizzards and working hard to save animals while feeding 15 people doesn’t seem that humorous, but in light of the death of her mother and baby brother, these were probably considered minor. It is all about perspective. 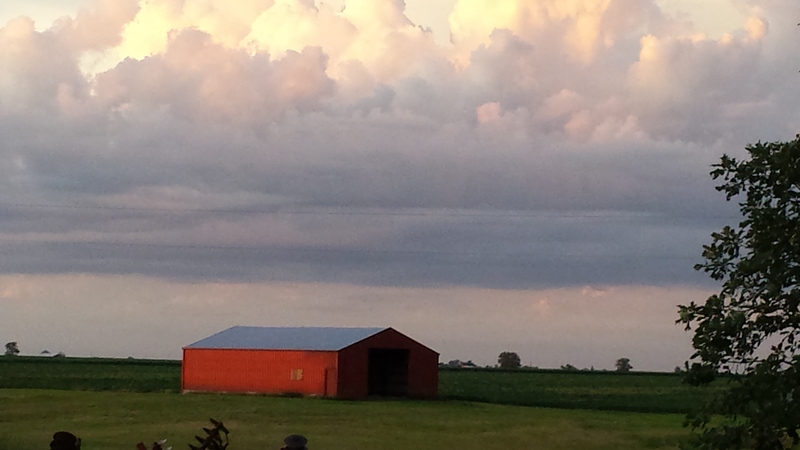 When you see the beautiful dark clouds of a storm, you often admire the vivid colors of dark blue, black and gray in the clouds contrasted against the deep green of the grass and red of the barn. From a distance, it is much more beautiful, but when you are in the middle of the lightning and downpour, it seems pretty bleak. Perhaps writing about our hardships is the same. When we write about them, they are pretty bleak, but when read those memories later from the distance, we appreciate the beauty of the picture. I certainly makes me appreciate the hardy stock I come from. I am so enjoying all the first-hand accounts of storms this week’s optional theme has evoked. Thank you for sharing yours!